Jon Newsome was one of many ex-Sheffield Wednesday players that played for Leeds United under the management of Howard Wilkinson and his time at Elland Road is one he will never forget. “The move came right of the blue to be honest. My contract was up at Sheffield Wednesday and Ron Atkinson, the manager, had offered me a new deal. However, opportunities had been rare during the 1990-91 season and I informed Atkinson that I had ambitions of regular first team football, even if that meant fulfilling those ambitions at a lower level." “I received a phone call from Mick Hennigan who I had worked with during his time at Hillsborough and he informed me that Howard Wilkinson wanted to see me at Elland Road the following day." “Howard said all the right things; he filled me with confidence and offered me a deal which I duly signed. He was aware of the good young players coming through the system at his former club and asked me who else was available for transfer. I informed him there were the likes of Marlon Beresford, Dean Barwick, Graham Hyde, David Johnson and David Wetherall. "Wilko asked me to keep quiet that I had signed and he instructed Hennigan to go and sign the players I had named." “It wasn’t the case at all. I had made it clear to Big Ron that I was willing to leave, my name was circulated and Mick Hennigan contacted me the following day. It was very much all above board." “There were the old Wednesday players and some lads I had played against on many occasions for the youth team and reserves, such as Gary Speed." “It was a blow because Howard had told me that he wanted me in and around the first team squad from the start. I was raring to go and prove my worth but the knee problem set me back." Newsome battled his way to fitness and the manager was true to his word. On the 22nd of October, Jon made his Leeds United debut in a home defeat to Nottingham Forest in the Zenith Data Systems Cup and then at the start of November, the youngster made his league debut as a substitute in a 0-0 draw at Wimbledon when he replaced Rod Wallace. “It was great to be involved but unfortunately I had one or two setbacks with the injury which all but kept me out until March." Jon was an unused substitute on Boxing Day against Southampton but the injury problem was limiting his progress. “I had played for Wednesday and I am a Wednesday fan but I was a Leeds player and I wanted Leeds to win that day. I don’t think the rivalry was intense back then but even so, I had to keep my head down when leaving the ground." “Mel Sterland got injured and I went on at right back, I was delighted to be given the chance but also pretty nervous. "The team had only won one of its last four games and we were reaching the business end of the season. I remember the goal well, I asked Gary Speed where Mel usually stood on corners, to which he pointed and told me I was going to score. "I timed my run and met the ball perfectly, the ball hit the net and Speedo couldn’t stop laughing. It was a fantastic moment." “Howard likened the situation to that of a golfer on the 18th. He told us that the golfer would focus on his swing and trust his swing. As long as he got that right, there was nothing else he could do. He stressed that we go out for each game and focus on what we had to do. At no point did we discuss winning or losing the league, we got on with the job in hand." Those were wise words as the rivals across the Pennine’s began to falter and drop vital points. “We knew that if we beat the Blades we would be in a great position by the time Manchester United kicked off at Anfield. "It was the most incredible game I have ever played in. It was a sunny day but it was blowing a gale, there were own goals and deflected goals, it was a crazy afternoon. Sheffield United used a different type of ball to the ones we had at Leeds and I believe it played a part in Rod Wallace’s goal which hit him and ballooned over the keeper into the net." 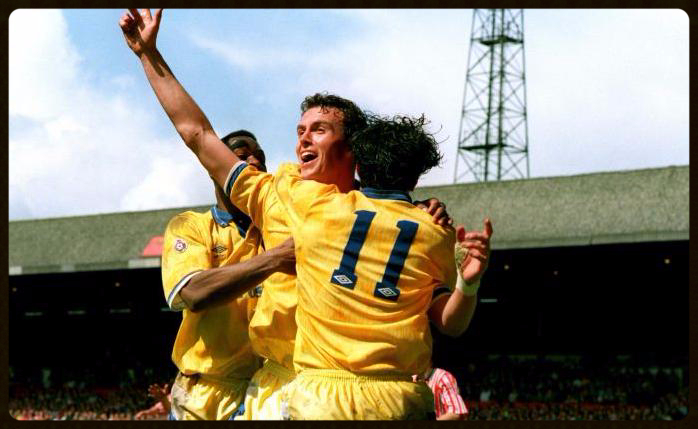 “The goal came from a free kick after David Batty was fouled by John Pemberton. Gary McAllister floated it over and luckily I was at the back post to stoop and head the ball into the far corner. "With my Sheffield Wednesday background, to score at Brammall Lane was an incredible feeling and there’s a brilliant photograph of me celebrating with some of the other lads. "I went to my parents and watched the Liverpool game and had a few beers. Once it was apparent that we were champions, the players arranged to meet in Leeds and we had a meal and a few more beers to celebrate what we had achieved." “Personally, I don’t feel that rule was an excuse. Look at our home form, we only lost one game and we couldn’t pass the ball back to John Lukic at Elland Road. "It’s far more difficult to retain the title than it was to actually win it. Manchester City have proved that but at the end of the day we had a terrible season away from home. The rot had set in on our travels and it was a miserable campaign." “Wilko brought David O’Leary to the club and I started the season on the bench, also Gary Kelly had emerged at right back and I was in and out of the side despite David’s injury problems. "It became frustrating and I think that when you have worked for a manager as a youngster it is easier for him to leave you out than it is to leave out a more experienced player who hasn’t been at the club for long." “As a player you want the manager telling you that you’re in the team and you know he can confide in you. That didn’t happen that season and I was struggling to cement a regular place. On one occasion, Gordon Strachan told me that he couldn’t believe I had been dropped and it was pretty frustrating." “I received a call from a journalist who told me that Leeds had received a bid from Norwich and it hadn’t been turned down. "It all came out of nowhere and ten days later I was asked by Wilkinson’s secretary to report to the ground to have a chat with him. He told me that he wanted to bring somebody in and a bid from Norwich had been accepted for me." “It was a good move for me; I had gone from a bit-part player at Leeds to become City’s record buy. They rolled the red carpet out for me and I was made club captain. "Despite suffering relegation, ironically after a defeat at Elland Road, I enjoyed my time down there and I was voted into their Hall of Fame which is a great accolade." Newsome left Norwich to return to Sheffield Wednesday but after a serious knee injury he retired from the game. “It keeps me busy and it is totally different to life in football but I enjoy it. My kids still live in Sheffield so it’s ideal." Jon looks back at his time at Elland Road with some great memories and the knowledge that he contributed to Leeds United winning the last league title before the Premier League was introduced. Thank you to Jon Newsome for giving me his time and the opportunity to write this article.